It’s hard not to look like a mess when using gold colour eyeshadow and glitter especially for girls as hopeless in that department as I am. But since the autumn dinner party season is just around the corner, I am feeling frisky and hopeful that maybe I could rock this swooworthy trend this season. Just picture it with a little black dress, sweater tights, long boots and a messy side braid. A sassy little combo, wouldn’t you agree? Does gold eyeshadow tickle your fancy as well this season? What's your autumn eyeshadow colour of choice? - Le Crayon Khôl eyeliner in black coffee. - Lancôme Artliner in noir. - This 5 shadow liner palette in bronze amour. - And your favourite mascara. And here are the step-by-step instructions, plus this nifty little mess-free glitter trick: Before applying glitter, always dip your brush first in water and then dip it in the glitter. This way the glitter doesn't fall all over the face. P.S: Plus, 5 steps to purple perfection. P.P.S: And the perfect nail polish for autumn. linda cor, dá um toque chique, essas cores combinam com qualquer tom de pele. Gold eyes are so pretty! Even though I'm more of a silver girl! Love it! So pretty!! I find doing eye make-up such a pain. I'm hopeless at eyeliner. But one product that makes it super easy is an eyeshadow stick. A friend gave me a Laura Mercier caviar stick and it is amazing! Just sweep it over and blend a little, voila! DONE! I love this for a day look... It has a natural feeling with a little glow! So beautiful! I see this often in Hawaii with the beachy, bronzed look for the year round summer. But the adaption to fall is something i never really thought about before. Minha vida de campo, so true! It's perfect for any skin tone. An eyeshadow stick, Katie? That sounds awesome. I need one of those right about now:) Thanks! So true, Punctuation Mark. LOVE! 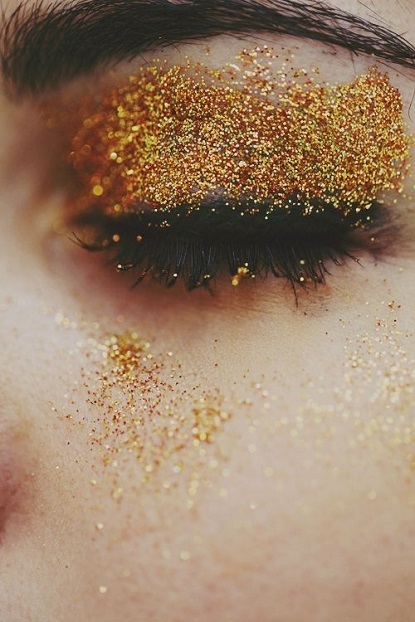 I would definitely try a gold, glittery eye! Get one, Diana! :) They are so great and easy!! Rimmel has some pretty nice, affordable ones that are good to test out on. Great tip, Katie:) I will get one this weekend to try out. Thank you, sweetie. wearing glitter is too risky for a contact lens wearer like myself, but I am loving the shimmer of Clinique's eye shadow pencils! !